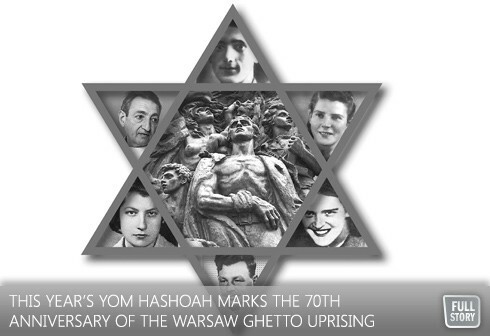 By Daniel Koren-- Marking 70 years since the Warsaw Ghetto Uprising, this year’s Yom Hashoah V’Hagvurah (Holocaust Remembrance Day) represents the strength and courage of Jewish freedom fighters who risked their lives to stand up to the Nazis during the Second World War. On April 7, 2013, we pay tribute to these brave men and women, and remember those who lost their lives during this dark period in history. Thus wrote Yitzhak Antek Zuckerman, a hero of Jewish resistance, and leader of the Warsaw Ghetto Uprising. Today, Zuckerman’s words act as a guiding principle through our ongoing commitment to Holocaust education, particularly on Yom Hashoah, in a bid to prevent further genocide. Presented by UJA Federation of Greater Toronto’s Sarah and Chaim Neuberger Holocaust Education Centre and the Canadian Society for Yad Vashem, “From Resistance to Remembrance” is the theme of this year’s Yom Hashoah V’Hagvurah (Community Holocaust Commemoration), taking place at the brand-new Schwartz/Reisman Centre at the Joseph & Wolf Lebovic Jewish Community Campus at 9600 Bathurst Street. It is the largest community Holocaust commemoration in the Diaspora, with dozens of community organizations participating. Featuring keynote speaker Amek Adler, Holocaust Survivor and current Deputy Chairman of the Jewish War Veterans Toronto Post, who will provide a glimpse into life in the Warsaw Ghetto, this year’s commemoration honours the 70th anniversary of the Warsaw Ghetto Uprising, paying tribute to Zuckerman and those who fought alongside him for the survival and freedom of the Jewish people. Yom Hashoah V’Hagvurah takes place at 11:00am on Sunday, April 7th at Schwartz/Reisman Centre at the Joseph & Wolf Lebovic Jewish Community Campus. Shuttle buses to the event are available by reservation only.